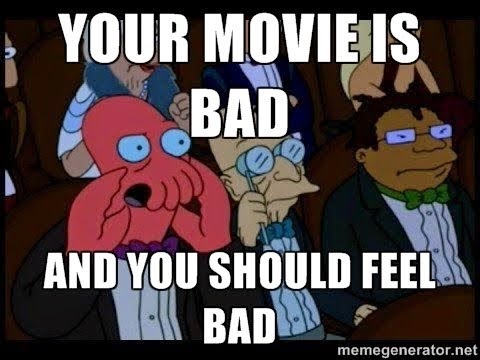 Your Movie is Bad and You Should Feel Bad: Twilight: Look! Up in the sky! Twilight: Look! Up in the sky! So, after finding out that Edward's rescue left an Edward-shaped dent in the tan car Bella was nearly smashed against--another dent that no-one but Bella ever notices--we deal with the aftermath. First, Bella argues with Edward about how he reached her so quickly (and not about how he stopped a speeding van with--okay, okay, sorry) until the ambulance shows up to take her away. Next, her father shows up at the hospital, filled with concern for his daughter, so she does the only appropriate thing: She 'tune[s] him out' so she can think about Edward. Then, the driver of the van is wheeled into place next to her, and he demands to know how Bella was able to get out of the way so fast. I guess I'm confused here, but after having both seen the movie and read the book, it's clear Bella didn't get out of the way at all. Edward got between her and the van and physically pushed it to a stop. Again, though, no-one appeared to take note of this, including Bella herself, despite the fact that the entire parking lot watched this occur. (Note that the van's driver saw Bella quickly move out of the way--ignoring for the moment the fact that she didn't--but failed to notice Edward stop the van with his bare hands.) The driver is apologetic, even though it was an accident and Bella was not seriously injured, so Bella responds by ignoring him as well. Dr. Cullen puts in an appearance, and...well, I don't have much to say about him. As I noted in a previous entry, the other Cullens are pretty bland and indistinguishable, at least in this first novel. The only giggle-inducing moment is that '[h]e was young', and indeed, in the film he looks practically the same age as Edward. So a man who looks to be in his late twenties at most has adopted a bunch of high-school kids. This doesn't turn any heads, in this small town that supposedly annoys Charlie with its gossip? They're pretty forgiving up there in Washington. 'I'm not going to tell anybody.' I said each word slowly, carefully controlling my anger. Raise your hand if you think he gives her a good reason, or any reason at all. No-one? Good, you've been paying attention. It's even funnier because we know that Bella's definition of a good reason to lie is pretty generous. Plus, and I hate to point this out--oh, who I am kidding?--but in this case, she isn't actually lying. She's choosing not to tell people what she saw, which is understandable since what she saw was impossible and she did suffer head trauma. So far, no-one has asked her, 'Bella, did you see Edward display superhuman strength and speed?' Imagine you saw your boss momentarily float in midair in the middle of the office and then decided not to tell anybody what you thought you'd seen, as none of your co-workers apparently saw it. Is that lying? This has been such a heart-warming conversation for Edward and Bella that they 'scowl at each other in silence', a silence Bella breaks with a meta-Freudian slip. 'Why did you even bother?' I asked frigidly. Okay, Novel. If you're going to make the jokes, can I stop reading? Bella, 'not in the mood for chitchat' such as her father's question, 'What did the doctor say? ', 'barely knew Charlie was there' as he takes the ungrateful brat home. She eventually reveals that she is 'consumed by the mystery Edward presented', and I have to admit to be a little intrigued by this mystery as well. Why is he such a colossal jerk? Why does he attend high school? What does he see in an average high school girl that he hasn't encountered in the previous century? Oh, really? I hadn't noticed. Ok first I'm mad. This deleted my comment so typing it again. Edward should have let the van it her. I think the audience would have loved that. One she is ruder than real people. I would look for this movie on Mystery Science Theater where I would enjoy hearing the movie tore to shreds. Thanks for doing that for me. It gives me my laugh for the day! Twilight: Am I Annoying You? Twilight: Guess Who's Back, Back Again?